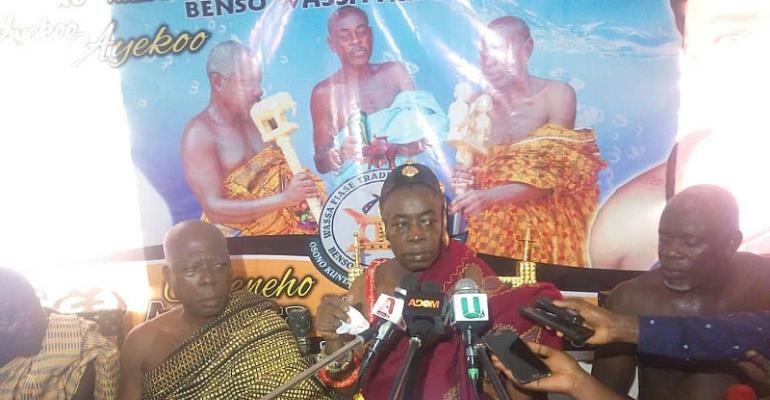 The Paramount Chief of Wassa Fiase Traditional Council, Odeneho Akrofa Krukokor II, Wassa Fiase Manhene has made a passionate appeal to president Akufo-Addo and Kofi Dzamesi, Chieftaincy Minister to as a matter of urgency reinstate him (Fiase Manhene). Consequently, he has given a one month ultimatum for his reinstatement. Addressing the media in a durbar at Benso in the Western Region today, he pointed out a minor chieftaincy dispute that rocked the area led to the cancellation of his name as a member of the National House of Chiefs. To him, that led to a legal tussle but the Supreme Court has ruled in his favour as the legitimate head of the Fiase Traditional Area. Odeneho Akrofa Krukoko II mentioned that the happenings has retarded and robbed the area of development. As a result, he is calling on government to revive the Bonsa Tyre Factory, Aboso Glass factory to provide job opportunities for the youth , as well as well construct health facilities and a police station in the area. “I am appealing to Nana Addo, l know he is a listening president; to as early as possible reinstate me to the National House of Chiefs. The Wassa Fiase Manhene, who rubbished his death rumour was installed in June 1994.